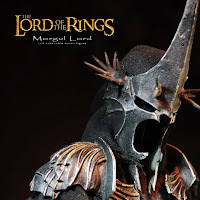 Here is the first of the 1:6th scale figures promised to us by Asmus Toys earlier this year, The Morgul Lord. This imposing figure is 13'7" tall and has a real metal helm! Accompanied by a wide variety of weapons and armor, this Nazgul has 36 points of articulation, so the poses and stances are endless! The set includes a stand so you can display this amazing figure in your home. It is available for $159.99 at Alter-Ego Comics.